Ice Cream Dreams is a family run business. 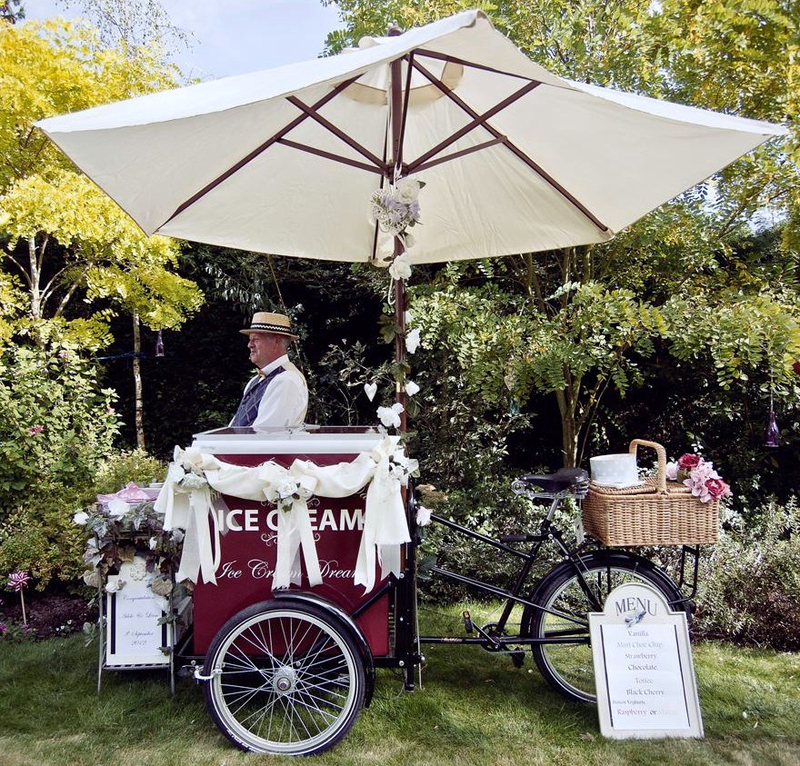 We use our selection of ice cream bikes to cater for Weddings, Civil Partnerships, Corporate events,Parties, you name it! We currently operate with four traditional ice cream bicycles and they are real show-pieces. These are perfect both indoors or out and therefore at whatever time of the day you choose. For indoor use or for outdoor in darkness, we illuminate the bikes and subsequently maximise the ‘Wow’ factor. Quick to deploy and easy to move. Therefore, we can get to places that a van can not. Why not let us fit into your event perfectly. Because we do like being the cherry on the top!! We serve only the very finest, handmade Dairy Ice Cream, frozen yoghurt or delicious Sorbet. This we order directly from the award-winning Dennetts creamery in the Lincolnshire Wolds. It’s so perfectly fresh and just how it should be. Consequently, this is one reason we are in such demand and have so many repeat bookings. These ice cream bikes will always have friendly, chatty and smartly dressed staff. All are qualified in food hygiene and fully insured. 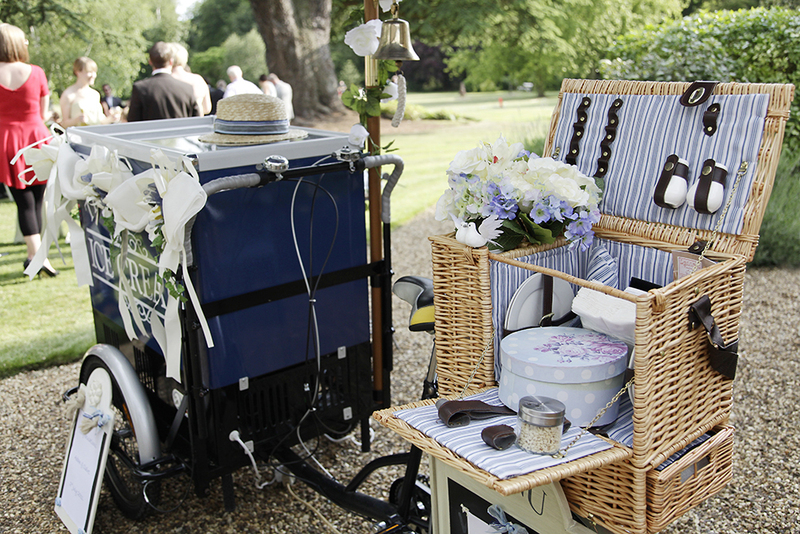 If you wish we will decorate the ice cream bikes, at no extra cost, to suit the occasion. Just let us know in advance and we will happily oblige. You can choose any of the available bikes to best match your colour scheme. We will do our best to dress it to match with what we have available to us. Most importantly, this is your day and it needs to go as perfectly as it possibly can. We will strive to help you achieve that aim and if all goes to plan then your guests will leave with a long lasting memory of the occasion. Therefore, please take a little time to navigate through our site. If you would like something a bit different for your occasion, we think we are surprisingly good value. And we are only a phone call or email away. Using locally sourced produce this Ice Cream is absolutely delicious, full dairy,made with double cream, 100% natural and very probably the nicest Ice Cream you will ever have tasted.